Sacramento native Ashley Hooks is a thrifty fashion blogger lives in hi-style on a lo-budget. She writes from Lodi, CA. 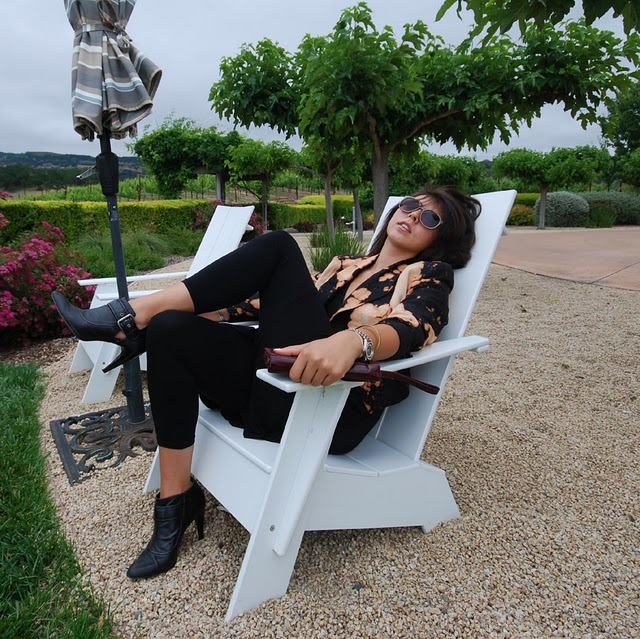 I am pleased to introduce you to a fellow Californian fashion blogger, Ashley Hook of Lodi, California. I heard about her from my BFF, a certain Ms. Moore, high school teacher extraordinaire who told me about one of her favorite students who has since graduated, who had the best fashion sense. The BFF then told me that Ashley had a blog, which I promptly followed. I am thrilled to have Ashley as a guest blogger at the Citizen, and I hope you take a moment to check out her blog: Rogue Roots. As a thrifty fashion blogger, I get a lot of questions and comments about the clothes I wear. Sometimes they are nice like, "That is so cute! Where did you get that?" and sometimes they are more subtly not-so-nice like, "Wow. I would never wear that. "﻿ But, the most wonderful thing about personal style is...it's all about expressing yourself. What joy! You don't have to dress for anyone but yourself! (and sometimes that is fun too). I think there are a lot of people out there though that are a little hesitant and unsure about personal style, especially when it comes to incorporating thrifted items into their wardrobe. So, I've created some quick tips on how to look fab without spending a fortune and still maintain a unique approach to dressing. 1. PAY ATTENTION TO PROPORTION If you don't read past this, at least read this because it is the most important part of dressing. We all, obviously, have different bodies. And we all have parts of our bodies that we like and dislike (trust me, even the skinny-minnies). So, when it comes to dressing, it's all about highlighting our best assets and cleverly camouflaging, well...the rest. However, proportion is not just about accentuation, it's about creating the illusion of balance and symmetry in the body - like makeup! This is especially crucial when it comes to purchasing items second-hand because a lot of styles that were once popular are, thankfully, no longer. Case it point: tapered "mom" jeans, shoulder pads in floral print t-shirts, etc. etc. My rule of thumb? When it doubt, throw it out. No sense in buying something that doesn't make you feel and look like a million bucks! 2. BUY YOUR JACKETS SECOND-HAND Jackets are a staple in any wardrobe. And they are often a key piece in bringing structure or an interesting focal point to an outfit. 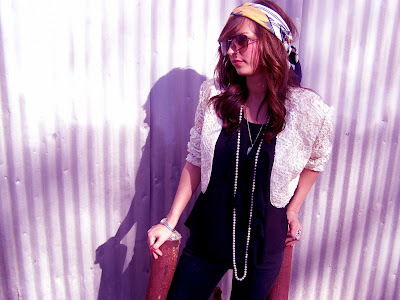 In high school, my greatest thrill was finding really beautiful and unique jackets from thrift stores and pairing them with more bohemian pieces like distressed flared denim or gaucho pants (hello, 2004). The plus side? A lot of consignment and thrift stores have a wide variety of jackets in all shapes, sizes and colors. And feel free to browse the men and children's sections, too! There are plenty of do-able options (like blazers, trenches and fur coats) if you keep an open mind and a sharp eye! 3. EXPLORE YOUR PERSONALITY I think the most important part of creating an individual style is to define your likes and dislikes. If you hate the color red or wouldn't be caught dead in sparkles, you obviously would not be drawn to a maroon sequined dress. But likewise, we all instinctively know what we enjoy outside of our closets. Well, the good news is, you can incorporate your personality into your wardrobe. For instance, if you are a nature buff, you can look for things that mimic the colors already found in nature: deep greens, chocolate browns, sky blues, etc. Or, if you're more of a sci-fi fan, look for items that are more asymmetrical, or perhaps have hints of neon colors. Whatever it is that you like, just remember to K.I.S.S. - keep it simple and sweet. And have fun! I hope this was helpful and that you all take stock in the fact that you are magnificent and unique creatures and deserve to be showcased to the world. Let the beauty of the world speak through you...and happy bargain hunting! Ashley is sitting pretty over at Rogue Roots. Great interview, such interesting answers!! Love Ashley's answers.. she is very pretty and photogenic.. Very true about proportions! I think the best way to tell is that if something looks off, it probably is. Loving the lingo, so upbeat and cheery. Very good advice, I think its too easy to get trapped into what you think other people want to see - after all, its all about showing the inner you! You are fantastic at spreading love Bella. Fabulous Ashley. I shall keep a close eyr on her blog. Thank you Bella for bringing Ashley to our attention! Ashley makes great points about thrifted style, but also just style in general. i love how Ashley addresses proportion first - balance is everything, visually as well as in the risks you take style-wise. after all, you get dressed anew everyday - no clothes are permanent, so take a chance now and then! I definitely agree that personality is essential for good style. Funny how sometimes people think it's all in the clothes. If that's important to you, you have to know yourself first before you can choose the right wardrobe. Rule #1 is definitely a cardinal rule! What a doll she is! She seems really awesome. I love thrift shopping for so many reasons. It's a great way to find amazing pieces that express who you are, and are very affordable. I think shes fabulous with a great sense of style....love the interview..and shame on ANYONE who would actually tell another person they didn't like their outfit in a negative way:(...pretty darn tacky if you ask me....you look fab sweetie....forget the haters...you rock!!! Interesting feature! I like her advice about looking to thrift jackets! The other great bonus is that they usually wear well and still look pretty good by the time they make it to a thrift shop! And, retail priced jackets are pricey! I'm loving this guest post. I think it's so important to express yourself through your personal style and shopping at thrift stores is an amazing way to do just that. Shopping malls produce clones ha! I'm starting to grow more and more into my own personal style and I've found the most inspiration in secondhand shops. There is so much variety and you really have to be creative. I feel like they've allowed me to explore my personality more than ever and that has led to an incredible amount of self discovery. I'll spend more time looking at the jackets next time! Fantastic post! Great advice about personal style, which I'm really working on currently. Trying to get out of a 10 year rut - Thanks so much!